For many disabled individuals, daily tasks as trivial as getting out of bed or turning on the lights can be difficult or outright impossible, requiring the help of a healthcare worker. 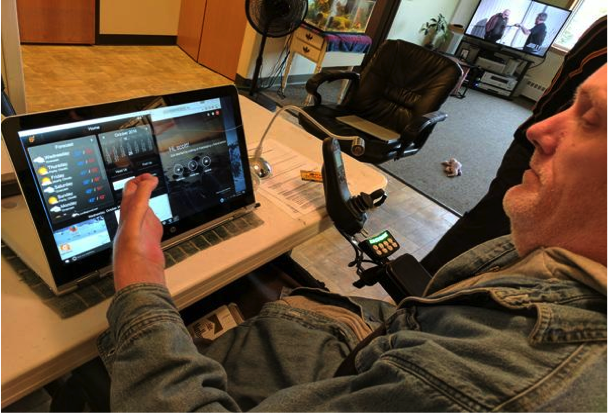 For one quadriplegic living in Minnesota, ELAN automation technology has provided a new lease on home life, giving him the ability to control his motorized bed, motorized apartment door, lights, TV and phone from a touchscreen laptop, tongue-driven mouse or Dragon-enabled voice control. According to Greg Elsner of J. Becher & Associates, the integration firm that installed the automation technology, combining this tech with healthcare products is the next step in home care. In effect, the client had little control over his own environment due to his disability. With only one semi-functioning hand, using traditional touchscreen devices or remotes was impossible. This meant that if his aid worker left for the night with the TV on and the lights off, that’s how it stayed until they returned in the morning. He couldn’t adjust volume, change channels or turn off the lights. Through clever use of automation technology and novel integration with his medical devices, J. Becher & Associates and Cybermation Inc., a healthcare technology firm, collaborated to build a system that allows full control of the apartment through large touchscreen buttons or a tongue-driven mouse. Mobility was of the utmost importance, so the tech experts worked together to figure out ways to connect the Invacare motorized bed and the Stanley motorized door with the ELAN system. Now the one-bedroom apartment works like this: when the client wakes up in the morning, he can use the ELAN app on his laptop to adjust his bed. From there, he can control four loads of Lutron lighting, his two TVs, and open his apartment door to exit the apartment. Once he moves outside the building, other features become important. In addition to the automation features, Ardolf made sure the client has as much use of the computer as possible. This meant creating easy-to-use mounts for the bed and wheelchair, so he can take the laptop with him wherever he goes. When it’s mounted on the wheelchair, he uses his tongue to control a special 3D-printed dual-joystick “mouse” mounted on the wheelchair that allows him to move the cursor and click, which he cannot do with his hand. For typing, he uses Dragon dictation software that allows him to surf the internet, and create documents that may even help him find a job. This project was completed for a modest budget of about $17,000 including all research, labor and equipment. New hardware included three Lutron dimmer switches, an ELAN system controller, a new Wireless-N router, a Panamax MR400 power conditioner to protect the system controller and router, plus a Xantech IR emitter to assist system connectivity.